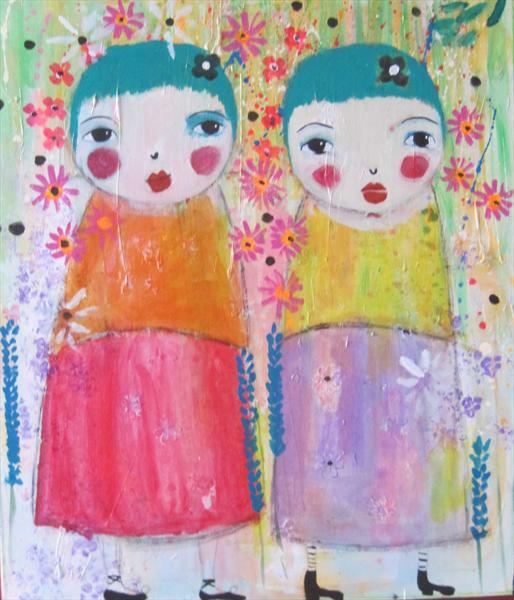 Isabel Adonis creates beautiful and colourful original works of collaged art. I would describe Isabel’s work as vibrant, unusual, and whimsical, and like many of my other favourite artists, never fails to make me smile whenever I see a new piece. She has been successfully selling her artwork for about 3 years, and it is all *very* reasonably priced for the effort she puts in and the amazing creation you get in return! The reason I love Isabel’s artwork so much is that it reminds me so much of my own, yet it is so different. I think the way in which we think about our creations can be very similar at times, and it’s nice to have that connection with a fellow artist. We’re similar in a way in which we love to paint women, girls, flowers and houses ~ loads of things that are based around our first passions, our home life and the different feelings and vibes surrounding that. If you would like to find out more about Isabel Adonis and her wonderful artwork, or purchase any of her paintings, you can ‘like’ her page on Facebook here or look and buy many of her artworks at ArtGallery.co.uk here.